Road closed in Great Smoky Mountains National Park. 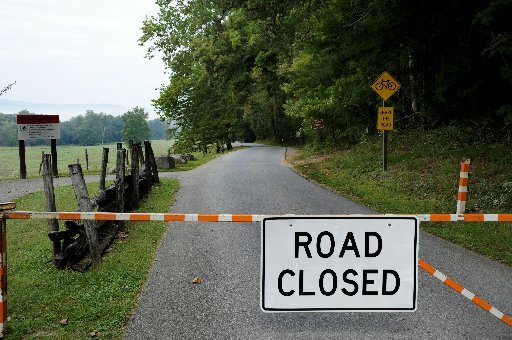 The closing of the Great Smoky Mountains National Park has cost the regional economy more than $23 million in lost visitor spending through the first 10 days of the government shutdown, according to a report released today by the Coalition of National Park Service Retirees. In addition, more than 257,000 tourists have been unable to visit the park since it has been closed and 11,766 jobs, including 11,367 local/non-park service jobs, are at risk, CNPSR says. Nationwide, $750 million in visitor spending has been lost at the 12 national parks studied by the coalition. The coalition describes itself as a non-partisan, non-profit organization comprised of former employees of the National Park Service. Click here for the coalition’s news release. This entry was posted in Economy and tagged Coalition of National Park Service Retirees, Economy, government shutdown, Great Smoky Mountains National Park, spending, visitors on October 10, 2013 by Roger Harris. University of Tennessee economists predict modest improvement in the Tennessee and national economies in 2014, according to fall 2013 Tennessee Business and Economic Outlook released Thursday. “While growth is subdued due to reduced federal government spending and a global slowdown, the expansion has shown a much-welcomed resilience,” said Matt Murray, associate director of UT’s Center for Business and Economic Research and the report’s author. “The outlook for 2014 is encouraging, but the economy continues to confront a number of domestic and international challenges,” Murray added. Residential and non residential fixed investments and exports will drive growth next year, while reduced federal and state government spending “will be the primary drags on growth,” Murray said. Unemployment will continue to fall in 2014, but a decline in labor force participation continues to be a problem, the report says. The state’s unemployment rate, however, will average 8.2 percent for 2013, compared to 7.6 percent for the nation. Tennessee’s unemployment rate was 8 percent last year and is expected to drop to 7.6 percent in 2014 and 7 percent in 2015, according to a news release. Personal income in Tennessee is expected to grow 2.6 percent this year, slightly lower than the nation’s 2.7 percent rate of growth, and improve to 4.4 percent in 2014. Professional and business services, leisure and hospitality services, and manufacturing sectors will see marginally slower growth next year compared to this year. Eating and drinking establishments and food stores will experience strong growth this year. Taxable sales growth for 2013 is expected to be 3.2 percent, well behind the 4.7 percent growth rate of 2012. It will see modest improvement in 2014 to a projected 3.5 percent. Automobile dealer sales were especially hot in 2012, up 10.1 percent, as consumers continued to satisfy their demands for vehicle upgrades. A cooling of sales will take place this year, with a rebound to 4.4 percent growth in 2014. Click here for the full CBER report. This entry was posted in Economy and tagged automobiile sales, Center for Business and Economic Research. Matt Murray, eating and drinking establishments, economic growth, Economy, leisure and hospitality, Personal Income, professionl adn business services, taxable sales, unemployment, University of Tennessee on September 19, 2013 by Roger Harris. Emkes, state commissioner of finance and administration, is expected to talk about the state fiscal situation and implementation of the Affordable Care Act. The forum meets Feb. 7 at 7:30 a.m. at Club LeConte on the top floor of the First Tennessee Building, 800 S. Gay St..
Emkes oversees all of state government’s budgeting and finance operations. He previously spent 33 years with the Bridgestone Firestone Corp., retiring as chairman and CEO of Bridgestone Americas Holding Inc. This entry was posted in Economy and tagged Bridgestone Firestone Corp., Club LeConte, commissioner of finance and administration, economic, finance, Knoxville Economics Forum, Mark Emkes on January 30, 2013 by Roger Harris. Sen. Bob Corker, R-Tennessee, said today the economy won’t tumble over the fiscal cliff, despite all the gloom and doom talk coming from Washington. He didn’t explain exactly how the government would avoid the cliff, but suggested the debt ceiling is a more important issue. Click here for more fiscal cliff coverage by CNBC. This entry was posted in Economy and tagged debt ceiling, Economy, fiscal cliff, Sen. Bob Corker, spending cuts, tax hikes on November 13, 2012 by Roger Harris. Tennessee’s economy is moving forward, but progress remains painfully slow, according to a University of Tennessee report released today. After “exceptionally strong rates of economic expansion” in the first quarter, the state economy slowed sharply in the second quarter as effects of the debt crisis in Europe rippled across the globe, says the fall 2012 Business and Economic Outlook. However, UT economists see the state and national economies posting modest gains through the first half of 2013. Significant economic improvement is still a year or two away, according to the study prepared by the university’s Center for Business and Economic Research. 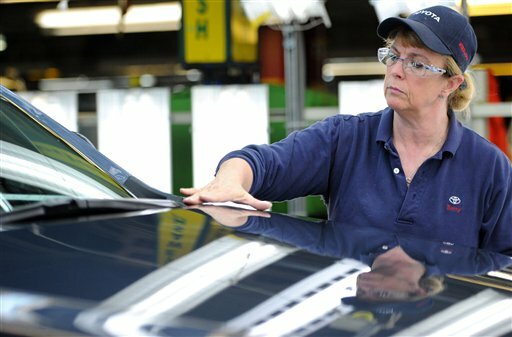 This entry was posted in Economy and tagged automobile manufacturing, Center for Business and Economic Research, Economy, housing, job growth, Matt Murrary, University of Tennessee on October 31, 2012 by Roger Harris. Dean Baker, co-founder of the Center for Economic and Policy Research, says Romney economic advisers Kevin Hassett and Glenn Hubbard got it all wrong in a Washington Post opinion piece published Wednesday. Lowering marginal tax rates, as Hassett and Hubbard suggest, would do nothing to boost the economy, Baker writes in a commentary on econobytes. “In short, it is difficult to see how the tax policy being promoted by Governor Romney will have much of a positive impact on investment and growth, especially if it is accompanied by further cutbacks in government spending. While the Obama administration’s stimulus policy was clearly inadequate to make up for the shortfall in demand created by the collapse of the housing bubble, Governor Romney’s plan is not likely to do any better,” Baker says. No surprise that the founder of a progressive think tank would differ from the Romney camp. Nonetheless, Baker offers an interesting counterpoint to the Hassett-Hubbard suggestion that lower marginal tax rates are need to boost business investment. Click here for Baker’s commentary. Click here for the Hassett-Hubbard commentary. This entry was posted in Economy and tagged center for economic and policy research, dean baker, econobytes, Economy, Glenn Hubbard, housing bubble, Kevin Hassett, Obama, recovery, Romney, tax cuts on August 17, 2012 by Roger Harris. Despite what we hear from the far right, the U.S. economy is not circling the drain. Dallas Federal Reserve President Richard Fisher made that clear in an interview with CNBC today. Fisher said that CEOs around the country tell him that they feel better about the economy. ” …The tone is a lot better. It’s not brilliant; we don’t have enough new hiring taking place, (but we’re) definitely moving in the right direction. … Things are better than the numbers might suggest or at least moving in the right direction,” Fisher said. After listening to the drumbeat of doom that is the Republican presidential primary, it’s refreshing to hear a voice of reason. This entry was posted in Economy and tagged business prospects, CNBC, Dallas Federal Reserve President Richard Fisher, Economy, right direction on February 23, 2012 by Roger Harris. New reports showing retail sales growth, increased industrial production and continued investment in business inventories are clear signs of an improving economy. And this suggests we could see accelerated job creation in the coming months, says John Challenger, CEO of the outplacement firm Challenger, Gray & Christmas Inc. This entry was posted in Economy and tagged business inventories, Challenger Gray & Christmas, Economy, industrial production, Job creation, John Challenger, recovery, retail sales on February 15, 2012 by Roger Harris. Americans feel better about the economy and they’re buying more premium-priced spirits to celebrate. The Distilled Spirits Council of the United States on Monday reported increased revenue, volume and record exports in 2011. Revenue and volume have returned to pre-recession levels, driven by an improving economy, consumer confidence and product innovation, the council said in its annual industry review for Wall Street analysts. “These results show that the hospitality industry is helping drive the national recovery and job creation, but it remains critical that legislators don’t derail future economic growth through higher taxes,” said Cressy. This entry was posted in Economy and tagged consumer confidence, Distilled Spirits Council of the United States, Economy, exports, Jack Daniel's Tennessee Whiskey, recovery, revenue, Russia, spirits, volume on January 31, 2012 by Roger Harris.